I have, with more than ample justification, been highly critical of FEMA on this blog and in my book Warnings. You'll find recent articles here and here. If you go to Twitter and enter #FEMA as a search you'll find complaint after complaint after complaint. I have been candid in in that I don't a solid suggestion(s) as to how to fix it. 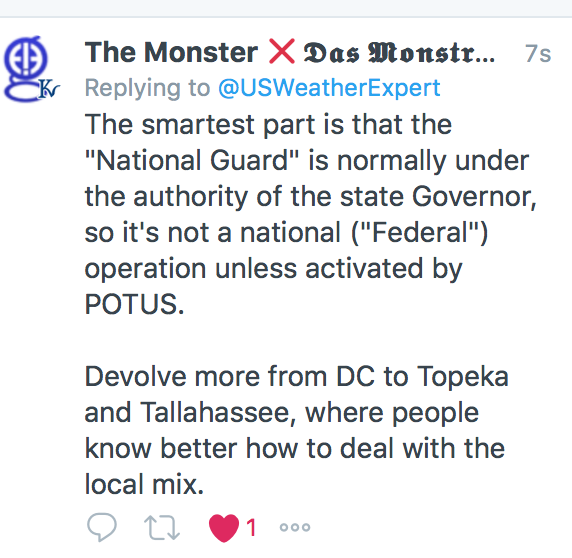 There is a case to be made that there is a need for federal coordination in a mega-disaster (huge hurricane affecting multiple states) or a huge earthquake. However, if your home was just blown away, your focus is on your family and your home and you don't directly care much about people 75 miles away. You need help at your location. A friend of mine has made a highly innovative suggestion I want to pass along. As I said in the article at the red link, the #1 problem with FEMA is it tried to deal with 600+ disasters last year. That is ridiculous. Absolutely ridiculous. A surprisingly large number of those are forest and wildfires. Forest and other fires should be handled by the US Forest Service. 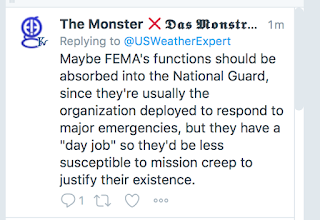 If FEMA has people with special expertise in fire disaster recovery, by all means transfer them. FEMA needs to be focused on people, not trees. As to the number of disasters, unless it is an exceptional year, FEMA shouldn't deal with more than 20 or so disasters each year. 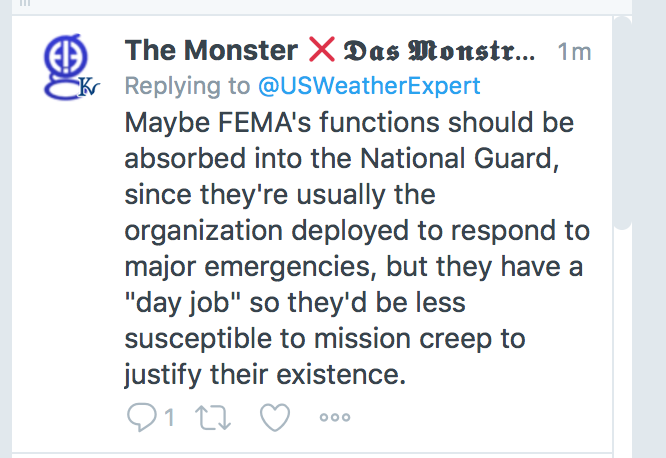 I understand mission creep and I understand why politicians love to swoop in with FEMA like conquering heroes. But, it just isn't working. The National Guard is made up of highly motivated and trained volunteers. Volunteers. That means there is no big staff and overhead with nothing to do when Mother Nature is smiling. 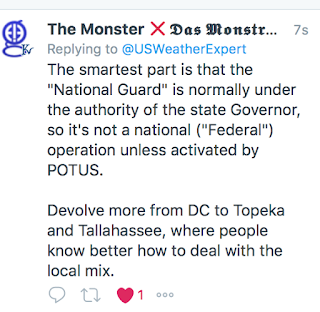 Yes, there needs to be increased disaster management training at state level and the (greatly decreased) FEMA staff can come in and help in a consulting role, when needed. Are there many details that would need to be worked out. But, it is an idea certainly is worth considering. What Does "Diversity" Really Mean? How Bad or Good Were The Forecasts for Florence? Hurricane Fran: Is 'Price Gouging' A Good Thing? Florence Flooding: The Rains Aren't Over Yet! What Is Wrong With the Washington Post? Hurricane Florence: Flu Risk Update!